ALL our 2017-2018 Planners are NOW EDITABLE! This means you can type in the subjects/seminar names as well as dates, study reminders, and more. Make your planner unique to you! We now have planners that start on all different days. You can pick based on what day your community or homeschool group meets! Do I Still Need a New Planner for Each Level or Grade? Since all the planners are editable, they no longer contain the names of the subjects/seminars for any specific homeschool program, so rather than having to purchase a separate planner for each of your Challenge kids, you can just purchase the one for the day of the week that your community meets. If you’re a Tuesday group, then just purchase ONE Tuesday Community Day planner and use it for all your Challenge kids. Type in the subjects/seminars for each Challenge level and print for each kid. How Do I Get a Cover for Our Level? The covers are sold separately. You can add one when you purchase the planner in our store. Can I Use It Year after Year? YES! No more buying a new planner each year! As long as you still meet on the same day of the the week, you can just edit your planner and reuse for the next Challenge program! Why is the Community Day at the End? While CC Foundations community day is considered the first of your week, in Challenge, the community day is the culmination or ending of your week. It’s a little confusing at first, but it makes perfect sense. You work all week on your assignments then bring them to class to have discussions and conversations about what you did/learned/researched. My son and I were always confused about the week, and the planner from last year just wasn’t working. He’s a Thursday group so having a typical Mon-Fri with weekend at the end just wasn’t making sense. I would end up crossing out the days and re-writting them each week, so I finally made a custom planner. When I showed others, they wanted it that way too, so our new community day planners were born! How to I Print and Bind It? The planners come ready to print double sided (for the weeks) if you want. They use very little color, so if you choose to print at home, you won’t be using much ink. You can also print in black/white or grayscale and they look great! First – make all your edits – type in all the information you want. Our planners are made so that all subject headings will repeat on each week. You can type in the dates, community/campus week number, and anything specific on the days that you wan. For example, if you know that every Tuesday you want to remind your child to make new Latin flashcards, you can type that in to each Tuesday under Latin. CC Challenge programs have 6 seminars, but these planners have an extra space. You can use that for extra subjects or for personal reminders like chores. Second – save your file! If you are using Adobe Reader DC (the most recent FREE version) you can now save your editable PDF files and keep all your text. Make sure you rename it to reflect which child’s planner you made. Then you can start over to make another child’s personalized planner! You can use the “press to clear” button at the top of the pages. This button does NOT show up on the printed page. Third– Print and Bind- Print at home either the whole year, a few weeks or semester at a time. Or you can choose to send it off to be printed. If you are a CC Family, you can use a discount card for Office Max/Depot that gives you black/white for .02 cents! There is also a color print discount! The spiral binding is also very inexpensive. I usually don’t bind my son’s planner. We combine his planner with his Challenge Guide so I just 3 hole punch it in a way to shows the week as a two page spread. My daughter likes her spiral bound though. Why Did You Change Your Planners (Not Specific to CC Anymore)? Over the last 3 years we have been making Challenge Student Planners and we’ve loved it. It started out of my own personal need when my son started Challenge A. Last year we had to make some changes to the planners in order to honor Classical Conversations request to remove all CC official names from our planners (like “Challenge A”). Unfortunately even though our planners did not contain any copyrighted material (lessons, memory work, etc) there were many planners being made and sold or given free that DID contain actual CC material printed inside. 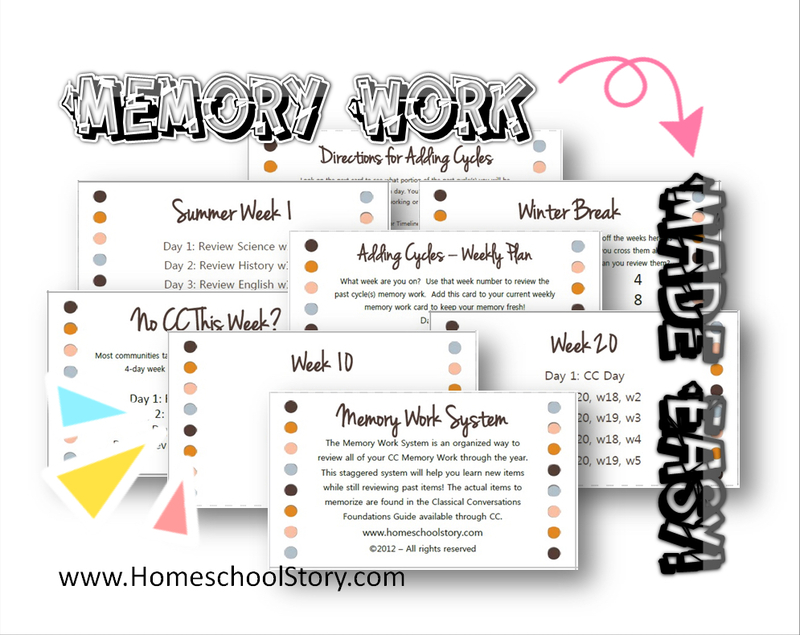 At HomeschoolStory.com we have NEVER done that and we strive to honor ALL copyrights so we decided to even go further to ensure that we were not crossing any lines ourselves.Our planners did have the seminar names for each Challenge level and we have no removed those as well. We made them all editable so you can just type in those seminar names yourself. Please help CC by NOT purchasing or downloading any materials that contain copyrighted information. As a digital publisher, we have be the target ourselves and sadly see some of our own creations taken and used in other people’s products. Go to the store to see all our options!